The Farnsworth Museum in Rockland, Maine always has Wyeth artwork on view, having dedicated an entire center to this family of artists. The current show weaves Andrew Wyeth’s work together through four different exhibits in honor of what would be his 100th birthday. The focus is on his work produced in Maine during his lifetime. From my first introduction to Andrew Wyeth as a teenager in the late 1960’s, I was fascinated with his work and with the talent that has passed through three generations. I was therefore quite surprised to encounter work I had never seen before, or even knew existed, when I visited this exhibit. The Farnsworth has done a wonderful job of giving the observer a glimpse into Wyeth’s studious approach toward creating art by presenting numerous sketches and studies in one exhibit within the Museum, and finishing with many of the final pieces exhibited in the Wyeth Center across the road. 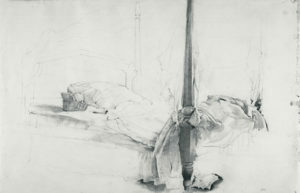 The Hadlock Gallery presents Wyeth’s sketches, which are beautifully rendered, and a reminder of how important drawing can be to the end result. They are also a visual insight into Wyeth’s method of working through the challenges of composition and subject prior to the final painting. 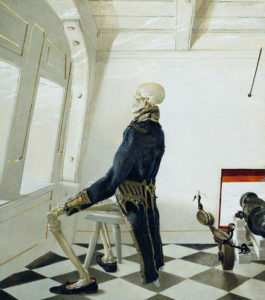 Between the exhibits of sketches and final paintings is one gallery dedicated entirely to his piece entitled Dr. Syn. The sketches and watercolors build upon one another around the room as he explores and modifies his subject. Eventually you reach the culmination of all his studies produced in a tempera painting. To say it is odd and quirky is an understatement, but that is part of the fascination. 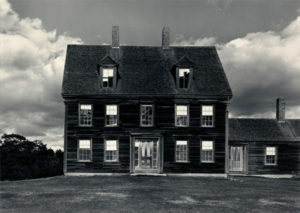 The fourth exhibit focuses on photographs of the Olson House taken by a variety of photographers over time. This home featured in many of Wyeth’s Maine paintings but was made famous by Christina’s World, which was purchased by MOMA in 1948. An exhibit of Wyeth’s in Maine would not be complete without a nod toward his most famous painting, however this seemed a bit contrived. The history of the house was interesting, but there clearly wasn’t enough material to fill the gallery with original photos during the time period that Wyeth spent there with the Olsons. As a result the majority of the photographs were taken after the Olsens were gone. 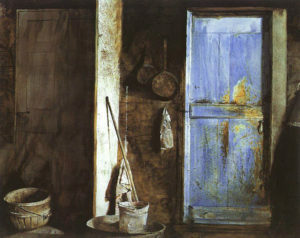 They represented other people’s interpretation of the house, which had little to do with Wyeth or the Olsens. Each of these four exhibits have different closing dates. To see all four you need to visit before September 9th. Check the website for individual closing dates. 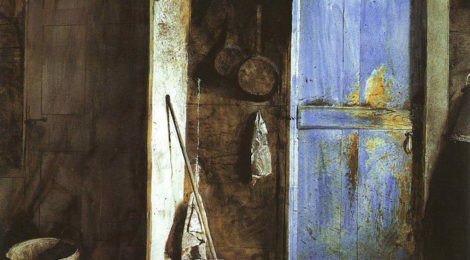 One of my favorite books on an artist is Andrew Wyeth: A Secret Life. I never agreed with the negative criticism of his art. I have not seen many in real life but am moved by them and in awe of his artistic ability.